Ray Emery of the Chicago Blackshawks purchased his first pair of Kenesky pads in 1990. In 2013, he returned to Hamilton and Kenesky’s store with the Stanley Cup. 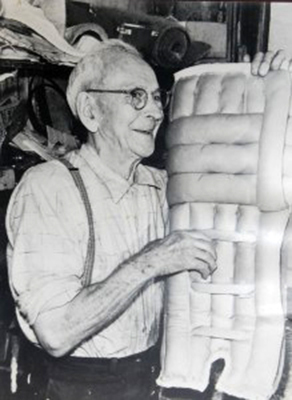 Emil “Pops” Kenesky invented a new and better goalie pad in 1924 that quickly became the pads that National Hockey League (NHL) hockey players sought. Kenesky immigrated to Hamilton in the early 20th century from Eastern Europe. He originally opened a shop as a harness maker, then became a bicycle retailer before adding sporting goods to his inventory. Kenesky helped develop hockey pads that were modeled on cricket pads, but wider at 12 inches, for local goalie Jackie Forbes. Soon after, goalies from other professional teams were getting their pads from Kenesky. Only the top goalies were able to get their hands on a pair, as the small store was just able to produce 300 a year. In 1969-71, every goalie in the NHL wore Kenesky pads. When Kenesky died in 1974, his sons Jack, Otto, Frank and Ed took over the business – which still operates today. Learn more about Pops and the history of Keneskys’ goalie pads on their website. See the building where Pops ran his shop and invented the hockey pads through the Historical Hamilton website.